Your morning coffee isn’t just for drinking. Well, the actual coffee liquid is, but the grounds? Don’t throw those in the compost just yet. 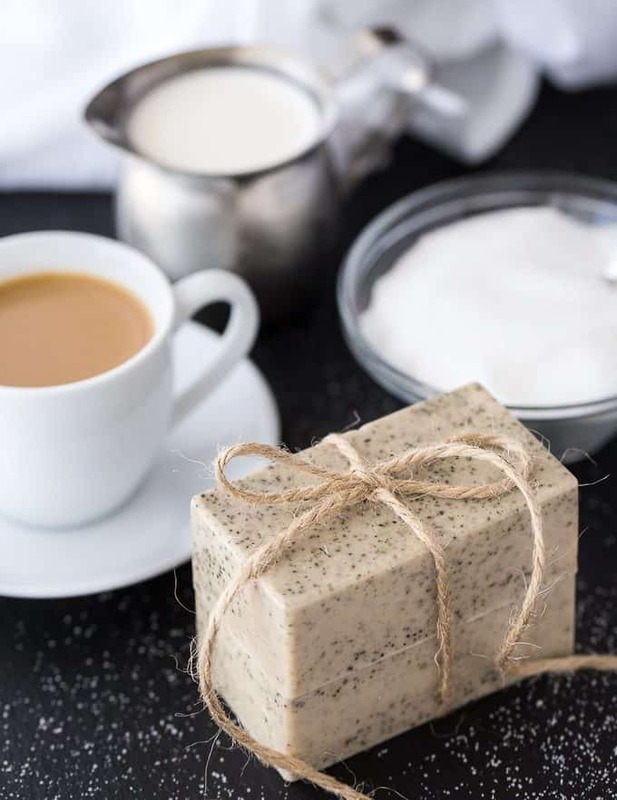 You can use them to whip up a quick batch of this lovely Vanilla Coffee Soap. It’s made with three ingredients: Goat’s milk melt and pour soap base, coffee grounds and vanilla soap scent. I love how it looks with the pretty coffee flecks spread throughout. Add Goat’s milk cubes to a microwaveable bowl. Microwave for 30 seconds. Stir. Microwave 10 seconds and stir. Continue to microwave at 10 second intervals, stirring in between, until melted. Stir in coffee grounds and vanilla soap scent. Pour into a silicone soap mold. Let sit at room temperature for 40 minutes to 1 hour, until hardened. Remove from soap mold by carefully pushing on the bottom to release the soap. Use ground coffee that has already been used in your coffee maker if you like. It even has a creamy milky colour of coffee thanks to the addition of the coffee grounds. Go ahead and make your coffee and then take what’s left from the coffee filter to make this recipe. You might as well get two uses out of them! With the holidays coming up, I know many of us are looking for gift ideas. Why not make your friends and family some soap? It’s super easy and they’ll be impressed with how nice they look (and smell too!). It can be our little secret about how easy it is to make soap with the melt and pour soap bases. For more DIY soap recipes, check out my Orange Creamsicle Soap and Honey Oatmeal Goat’s Milk Soap. What are your favourite soap scents? Love the smell of a fresh cup of coffee so would probably like this although I usually like the citrus scents in soaps. I’m not a coffee drinker but I do love the smell of it and vanilla is my favorite scent. 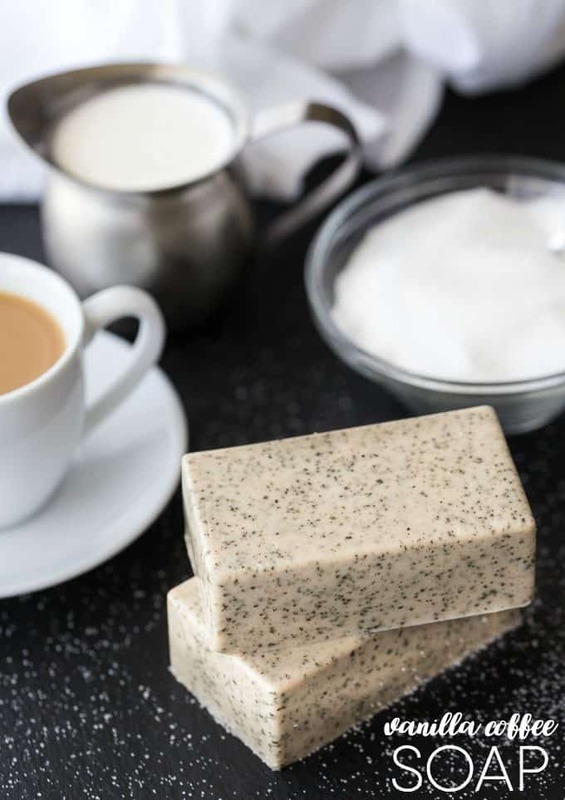 I am sure I could coax a coffee-drinking friend into assisting me in attempting to make this soap. I bet it smells delicious. This is cool, but where in the world do you get goat’s milk? Amazon sells it http://amzn.to/2cQ6IF1 or any craft store should have it. I bet this soap really cleans the skin great and exfoliates the skin with the coffee grounds in it. It sure is a pretty soap that I would love to make. We make coffee everyday, so already have the grounds. It would be fun to make some of this soap for Christmas gifts. This would make a great gift. Thanks for sharing!! That must smell sooo good! Oh gosh…I bet this is AMAZING!! YUMMY! I need 20 of these! This sounds great:)! I looked up the milk soap from the link you had and have a question. Would you say the 2lbs makes about four regulars sized bars? The 1 lb makes 4 regular sized bars for me. 2 lbs you’d get 8 bars. The mold I use is regular sized. this sounds like it would smell so amazing! Thanks for sharing it. what a cute gift this would make! I love coffee and these are a perfect addition to the restroom for the holidays. Also good for DIY presents. Thanks for sharing. Stopping by from Let’s be Friends. This looks amazing! I definitely need to make these for gifts… and to treat myself, too! 🙂 I’m here from The Pretty Pintastic Party! Your soap looks lovely. I’ve made cold-processed soap with goat milk, coffee grounds and vanilla; mine was dark brown like coffee. I like that you can see the grounds in yours, the flecks make it very pretty. And melt-and-pour is quick and easy, no waiting for the soap to cure. Thank you so much for sharing! My mom and I are planning on making soap as gifts this weekend and have been looking for some ideas. This looks perfect! How long do these last before going bad? I want to give it as a gift but don’t want it to get moldy fast! I usually say for anything with food that they last 1 month. With these ones, I’ve kept them longer – up to 3 months. Do you have to use coffe gounds after making coffee or the ground coffe before making the cup of coffee? I used the grounds after making the coffee. How many bars of soap did this recipe make? Can you use vanilla extract instead of vanilla soap scent? I haven’t tried it that way so I’m not sure! Hi, looking forward to making these in the nearer future. Thanks for the share. Quick question. Was the used coffee grinds dried out after use or as is? Can Shea butter soap be used in place of Goats milk? Yes, feel free to substitute! Hi! Can you use vanilla extract as the vanilla scent? I don’t know if it would turn out the same with vanilla extract. Sorry! Hi! Is the vanilla fragrance that you used similar to or the same as an essential oil? Thanks! Yes, it’s similar to an essential oil.